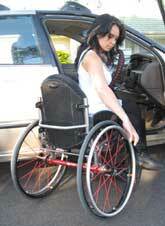 Do you require vehicle mobility for a disability? Do you require a comprehensive vehicle modification? Are you looking for a solution to a unique vehicle or driving barrier? Are you needing advice before purchasing an already modified vehicle? Do you need lessons to learn to drive a modified vehicle? Gaining access to a vehicle as a driver or passenger can offer greater independence. It gives you the freedom to reach places that can otherwise be too difficult to get to. It is advisable to seek expert opinion before proceeding with either the purchase of a vehicle and/or vehicle modifications, both to determine the appropriate modifications and that legal requirements are met. We are here to help. At Coastal Rehab, our Occupational Therapists are qualified in providing vehicle and transportation assessments that enable people with a disability, their families and carers to have more participation within the community with private transport options. Discuss the options available with you including any further assessments that may be required. Identify the most cost effective vehicle modification or transportation option. Complete the relevant documentation required. Recommend reputable installers or vehicle modifications or related equipment. Whether you are a driver, passenger or carer, we can help find a solution that is aligned with your needs.